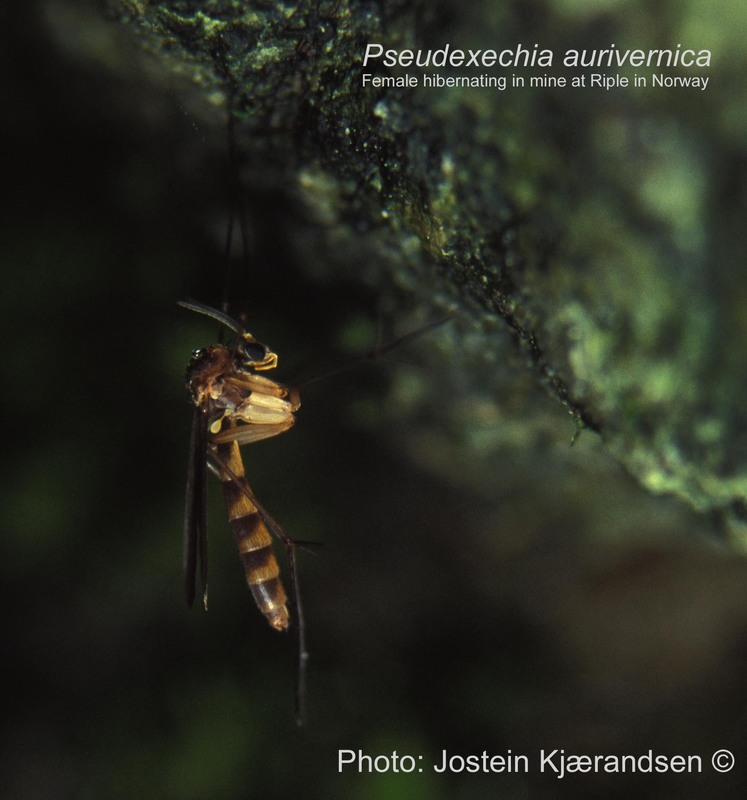 The text is based mainly on Kjærandsen (2009): The genus Pseudexechia Tuomikoski re-characterized, with a review of European species (Diptera: Mycetophilidae). The genus Pseudexechia (•) was established by Tuomikoski (1966) for a small group of closely related species in the tribe Exechiini, segregated from Exechia Winnertz by the absence of discal bristles on the mesoscutum (F), ovate clypeus (E) and distinctive features of the male terminalia such as the bud-like hypandrial lobe (B) (Chandler 1978, Kjærandsen & Chandler 2006). Staeger (1840) described the first species of Pseudexechia as Mycetophila trivittata Staeger, 1840. Zetterstedt (1852) then described a pale form of M. trivittata, later illustrated by Lundström (1909) and now known as Pseudexechia aurivernica Chandler, 1978 (Chandler 1978, Kjærandsen 2005). Tuomikoski (1966) included seven species in Pseudexechia, six European, one North American and one Afrotropical. He designated Exechia trisignata Edwards, 1913, described from Scotland, as the type species and noted that he had seen several undescribed species from Europe and Asia in the collections at the Zoological Museum, University of Helsinki, Finland. At present 26 species are associated to Pseudexechia (•): 16 are known from the Holarctic region (Tuomikoski 1966, Chandler 1978, Ostroverkhova 1979, Zaitzev 1982, Zaitzev 1988, Ostroverkhova & Stackelberg 1988, Chandler & Blasco-Zumeta 2001, Zaitzev 2003, Kjærandsen & Chandler 2006, Kjærandsen et al. 2007, Kjærandsen 2009), 3 are known from the Oriental region (Kjærandsen 1994, Kallweit & Martens 1995, Wu & Yang 2003) and 7 are known from the Afrotropical region (Matile 1971, Kjærandsen 1994). 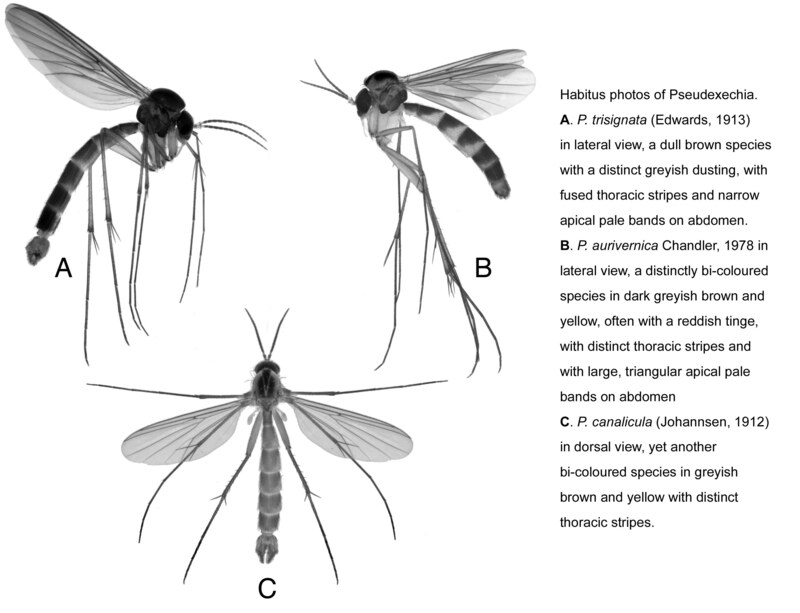 However, several further species from the Afrotropical, the Oriental and the eastern Palaearctic regions await description and a few that are described in other genera probably belong to Pseudexechia.